Pakistan is a lucky country which has 4 different weathers. But due to electricity down fall in Pakistan summer season is very miserable for Pakistani people. Even all people do not afford high prices of electricity. Most of Pakistani people use air coolers in summer season yet it does not provide more than cooling like air conditioners. Majority of Pakistani people belong to middle class or poor families. So air conditioners are not in the access of all people. 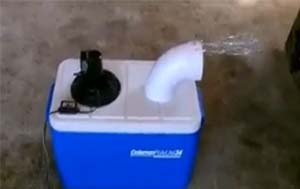 People of Pakistan want to a very cheap source of cooling. 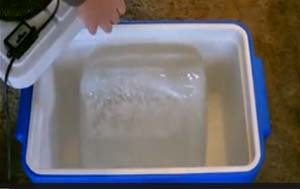 Therefore today in this post we are sharing a very unique trick of homemade air conditioner. We hope you would like it. Its very effortless even in case of difficulty you can watch tutorial video which moreover has been uploaded in this post. 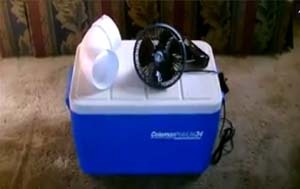 For making a very cheap homemade air conditioner your required an ice box, a small 12v fan, an pipe elbow & small block of ice. 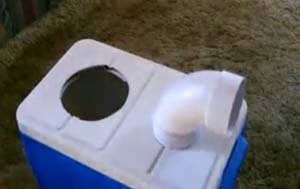 Make two holes one for fan & other one for pipe elbow. Both sizes should be according to the sizes of fan & pipe elbow. See Picture below for help. 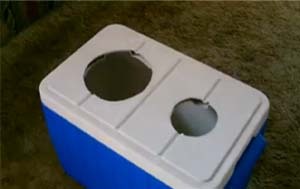 Now fix fan at the upper size of box & on the other hole put your pipe elbow. You can moreover use plastic tape or elfy road for fixing fan & pipe elbow. See picture below for help. 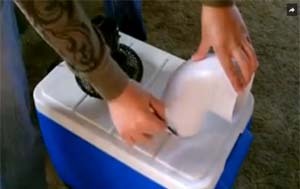 Now put ice block inside of the ice box. Ice box keep freeze ice for long time. 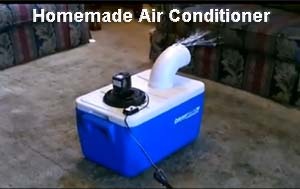 Now your homemade air conditioner is ready to use. Now plugin your fan & check temperature of your room. This air conditioner is only for a small room or small cabinet. Its working very fine. Its special gift for India & Pakistan where people have to face very hot weather. You can moreover watch effortless video tutorial for further assistance.